As we peel away the late 20th Century structures and reveal the original buildings underneath we start to find all sorts of interesting features and questions. 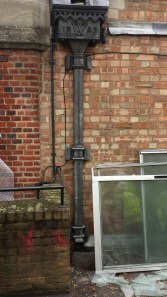 For example, this downpipe is clearly original but is only ten feet long so that it drains onto the patio of what was Flat 30 – a 1970s construction. Where did it go before the Rank building was built? All the way to the ground ( no sign that it has been cut off at some stage and there is no drain at ground level). Was it moved from somewhere else? If so where? Is the wall behind it original? Other questions. Why does the third floor of the Principal’s Lodge have fine oak floorboards in the rooms overlooking the court but rough pine boards in the rooms overlooking Jesus? Brian Beck tells me this is because they were servant’s rooms at the back. If so, who lived in the front rooms? Did they share the bathroom with the servants (shock horror)? Final question: were there gas fires in the original building? Some of the fireplaces in C block look as though they were built to take gas fires or in one instance an early electric fire from the outset.